According to the IPKAT, Dr Kfir Luzzatto, a veteran Israel Patent Attorney has published a book called “Do It With Words“. This is claimed to be a straightforward guide into the power of your mind. 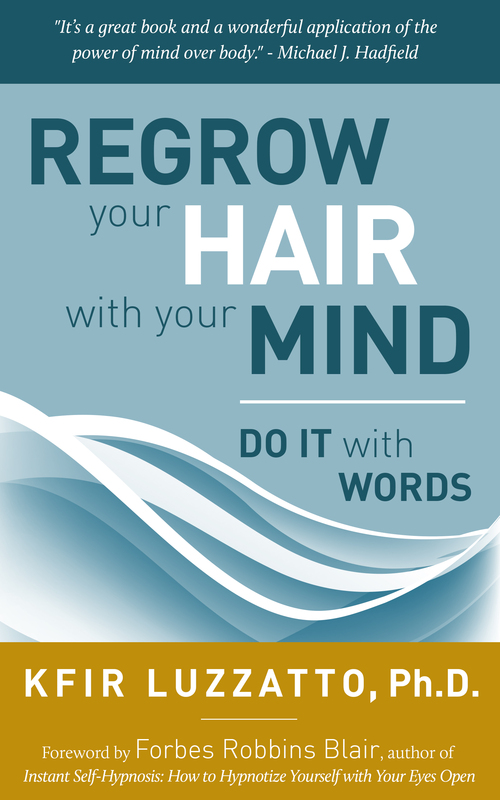 It provides visual proof and a precise blueprint of the mind-body experiment in which he apparently succeeded in his attempt to regrow lost hair and to restore the natural color to gray hair. used self-hypnosis, guided imagery and meditation to achieve all those results without the aid of any external preparation. I am, by nature, a cynic. (I assume that this comes as a great surprise to my regular readership). Having a long-standing interest in magic, I have several of Uri Geller’s books, books by Al Koran (a mentalist in the Sixties and Seventies in the UK who was formerly a hair dresser) including those aimed at the general public and those more informative that were aimed at the magical profession. I do believe that some aging processes and general deterioration may be reversed by concentration. Warts in particular are certainly susceptible to being charmed away. Now Dr Luzzatto seems to have discovered a way of stimulating hair follicles. I confess to often wondering about baldness at Israel IP events. However, I never considered Kfir one of the more obviously balding professionals. Nevertheless, there are a large number of Israeli IP professionals that are bald or balding, including the present commissioner Asa Kling, the Minister of Justice Employee responsible for IP legislation Howard Poliner, Head of Israel chapter of the AIPPI Tal Band, Eran and Nachum Gabrieli, Dr Shlomo Cohen, Jonathan Agmon, Michael Morris and Dr Erez Gur. Then there are a bunch of more hirsute professionals. I probably count in this group, as does Dr Meir Noam, Yaakov and Daniel Schatz, Sinai Yarus, Stanford Colb and Zeev Pearl. I propose that we do an experiment to put Kfir’s theory on a more rigorous scientific footing than merely his own testimony in this book. One of the criticisms thrown at Freud’s empirical research into various psychoses, is that Austrian middle-aged Jewish women were hardly representative of mankind. In a similar fashion, a group of Jewish Israeli male IP professionals is hardly representative of the general public. Nevertheless, it would be an interesting experiment. I am more than ready to pick up this gauntlet, Michael. If you can put together a small group of volunteers I’d be happy to teach the technique to them and run a controlled experiment. I never buy books by IP professionals. Authors and publishers send me courtesy signed first editions, and I review them. Seriously, I actually did notice that you were looking well at the trademark meeting at the patent office. I was thinking, perhaps we could persuade Mr T, Seligsohn & Gabrieli’s veteran patent attorney, to grow a Mohican? How many meetings to you need to teach the technique? It could be fun trying to get a control group of bald IP professionals in a group photo of before and after. One of your more illustrious forebears had a step by step approach leading to the spiritual level of prophecy, so hair growth is actually no big deal. I still think that a liquid formula sold as Kfir’s Mane – Patent Hair Restorer Cure would be a great give-away at IP events.